James posted 53 stories to The Journal of the San Juan Islands. The new school lunch pilot program impresses students, parents, just about everyone. Roast chicken with mashed potatoes and gravy – real mashed potatoes, on the first day of school. Build-'em-yourself soft tacos was on the lunch menu the second day. Pizza – that true test of any school lunch program – was on plates Thursday. Foreclosure proceedings on Friday Harbor Ace Hardware were postponed this morning until 10 a.m. Oct. 3. The legal proceedings surround the default foreclosure of the real property currently occupied by Friday Harbor Ace Hardware at the corner of Argyle and Web streets in Friday Harbor. The business was not on the auction block, but the property it sits on was scheduled to be and may be again in October. After 30 years in business, Friday Harbor Ace Hardware on Argyle Avenue is headed toward foreclosure and an auction on the courthouse steps Friday at 10 a.m.
Dr. Jan Smulovitz, a retired endocrinologist, asked about the $144,438 on the Inter Island Medical Center’s July profit and loss statement at the Aug. 20 Hospital District Commission meeting. The answer he received was, for him, disquieting. Tick toc, tick toc. Gather thee blackberries while thee may, for just as the dog days of summer turn the berries sweet, minutes turn to hours, hours turn to days and the ring of the school bell can be heard in the distance. Soon ... soon. 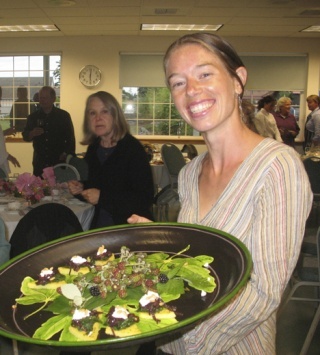 If chef Tom French of Whidbey Island has his way, San Juan Island School District students will be eating fresh, locally grown — and sometimes organic — hot lunches at school. Rain-soaked fairways and greens wreaked havoc at the annual Herb Kranick Memorial Golf Tournament Saturday and Sunday. It was the first time the tournament was opened to golfers younger than 55, and two collegiate golfers — Matt Cowell and Pearl Schuman — walked away with the tournament’s best scores. In 1909, several noteworthy things happened in Friday Harbor and on San Juan Island. Saturday’s rainy skies toyed with the entire field, but it didn’t matter a whit to the San Juan/ Lopez duo of John Bird and Fred Weedon, who both shot 5-under their handicaps Sunday and walked away with the annual Member/Guest Tournament title at San Juan Golf and Country Club. In an effort to begin to address the pollution running off our streets and into the bay, the Town of Friday Harbor has purchased a wastewater catchment system for town and charity use. A Bailer Hill family’s beloved pet alpaca, Panama Jack, was killed by dogs while the family was camping on Orcas Island July 29. Citing town restrictions and concerns from neighbors, the San Juan Island School Board and the Friday Harbor Athletic Association withdrew a conditional use permit application for further improvements to the Carter Avenue sports fields site. Updated: San Juan’s Relay for Life begins today at 5:30 p.m. They walk for their wives, their husbands, their parents and their children. Sometimes they walk for themselves. Breast cancer, skin cancer, leukemia, prostate cancer, lung cancer ... the list of deadly culprits is as endless as the list of loved ones cancer has taken away. Local duo Phil McKee and Ron Bates had little trouble at the annual Two-Man Best Ball Tournament at San Juan Golf and Country Club, shooting 65 on Saturday and a 69 on Sunday to capture the gross division. I’m in this show. I participate in community theater and was a member of Island Stage Left’s production of "The Tempest" 10 years ago. Forgive me if this doesn’t read like my usual stuff. An apparent miscommunication between San Juan County Sheriff’s Department and federal immigration officials resulted in the apprehension and probable deportation of a DUI suspect before his trial. The San Juan County Council voted Tuesday to change the permitting fees for the county’s owner-builder program, lowering fees for the majority of permits, raising them for the top 10 percent and levying a small graduated increase for the middle third of permit applicants. No one was hurt in two separate incidents at Roche Harbor Airport — a wheels-up landing Friday afternoon and an aborted takeoff by a San Juan Airlines flight Saturday afternoon. It’s soccer camp for the high school, and an unusual one for local players. Wolverine Coach Mark Fishaut called in some coaches of a quality not normally seen on-island. George Hageage and his wife Tamara run the women’s soccer program at Eastern Washington University. They came to the island last week to offer a soccer camp for Fishaut’s team. Some 29 girls and three boys signed up for the week-long camp. Each year, island animals are a favorite of parade watchers, whether they’re of the dachshunds-on-parade variety or the pirates-on-the-plunder kind. The more comfortable you can get them in their own skin prior to adolescence, the better they’ll be able to handle the onslaught on their identity during their teenaged years. Life skills. Empowerment. That’s why Missoula Children’s Theatre (MCT) and activities like it are so important. Devorah, aka “Firecracker,” that whirling dervish of musical energy and talent, has just spun-off her third music compilation, “Irrepressible,” a 10-track CD that marks a sea change in her music, featuring several songs of her own writing. Down by $800,000 at the half, the San Juan Island School Board last week disclosed that by the end of the third quarter, they had nearly made a comeback, closing on their opponent — a nearly 10 percent budget shortfall — to less than $100,000. With three months to go, the $100,000 in cuts, which would have eliminated the entire athletic budget, has been averted thanks to an overwhelming and committed team effort and a spectacular end-of-the-quarter play by Islanders Bank, who came up with the last $5,400 to restore the high school’s athletic program to last year’s funding levels. Sure, you can opt for the tried — some might say “tired” — and true standbys, and you can be sure that the hardware stores will have specials for Father’s Day in the tool department. The San Juan Hospital District Commission voted unanimously to accept and sign a non-binding letter of intent with PeaceHealth to further explore building a new integrated medical center on San Juan Island. The letter of intent must be approved by PeaceHealth’s Whatcom region Board of Directors as well as the system’s Board of Directors prior to taking effect. That approval is not scheduled until late July. The San Juan Hospital District Commission voted unanimously Wednesday to accept and sign a non-binding letter of intent with PeaceHealth to further explore building a new integrated medical center on San Juan Island. Ron Bates won his second San Juan Open, shooting a par 71 on Saturday’s first round and finishing Sunday with a 78. Bates’ combined score for both rounds was 149. In an unexpected action taken in today's executive session, the San Juan Hospital Board of Commissioners voted to offer Dr. Al Johnson the full-time physician's position vacated by outgoing Dr. Greg Moran, who leaves for private practice to Dallas, Texas in July. Wolverine Richie Ochoa’s solid play this year did not go unnoticed as the state’s coaches and sportswriters named him a 1A/B All-State starter. To deal with the ongoing noxious weed problem, to increase the program’s ability to do public outreach and education, and to recruit and use more volunteer labor, Amanda Azous asked the council to consider granting an increase in the county’s Noxious Weed Control property assessment. The new fee would charge $8.10 for each parcel of land and 81 cents for each additional acre. She said 93 percent of the all parcel owners would pay less than $16.21 per year. Citizens filled the Mullis Senior Community Center Wednesday with both support for and with concerns about a proposed Integrated Medical Center. Representatives from the Community Hospital Committee and PeaceHealth, which runs Saint Joseph's hospital in Bellingham were on hand to answer questions. Amid a chorus of voices singing "So Long, Farewell," students from Friday Harbor Elementary School gave an unexpected and heartfelt send off to Principal Jody Metzger on Monday. She was totally surprised. The best are back to raise money for science education. Jazz at the Labs will sell out again, you can bet on it. Last year, people packed the U.W. Friday Harbor Labs dining hall to listen to a bunch of guys from the Seattle music scene who have been playing together in various incarnations for years. San Juan Island artists throw open their studio doors for all to come in and see this weekend in the 17th annual Artists’ Studio Tour. The event is Saturday and Sunday, from 10 a.m. to 5 p.m. Eleven featured artists will invite in not just the public, but also 16 other local artists who will show their work in the featured artists’ galleries.